Nestora Salgado was arrested on 21 August 2013 in Olinalá, Guerrero, where she had served as a coordinator for CRAC, by Army and police units, accused of kidnapping. This presumed kidnapping of which she is accused was the legitimate arrest of a person accused of robbery, according to the CRAC. Meanwhile, Saira Rodríguez, daughter of Nestora Salgado, denounced that the previous week, she once again received a threatening phone call, and though she admitted being frightened by this act of intimidation, she also noted that it is a sign that the legal process to free her mother from incarceration is progressing well. “On 9 January, when I came to visit my mother, I received a call from an unknown number. It was a man who told me: ‘Pray to God that your mother remains where she is, because otherwise, you and your angels will pay the consequences.’ At that moment I became scared and I hung up,” Rodríguez noted in an interview with La Jornada. 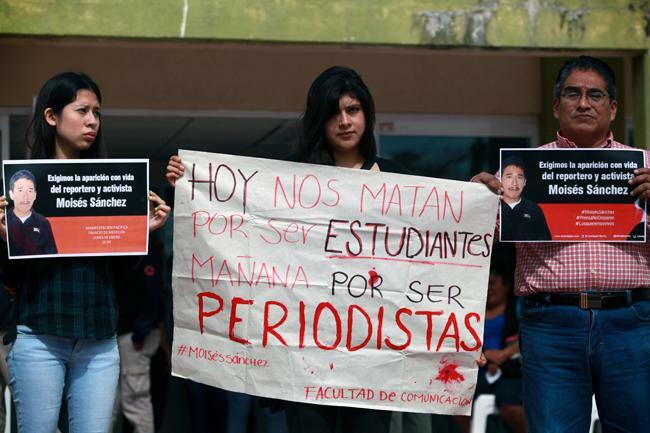 It bears noting that the government of Rogelio Ortega Martínez has presented a request for the cancellation of the charges against Nestora Salgado to Miguel Ángel Godínez Muñoz, the state prosecutor, who must now evaluate whether this is to proceed or not. 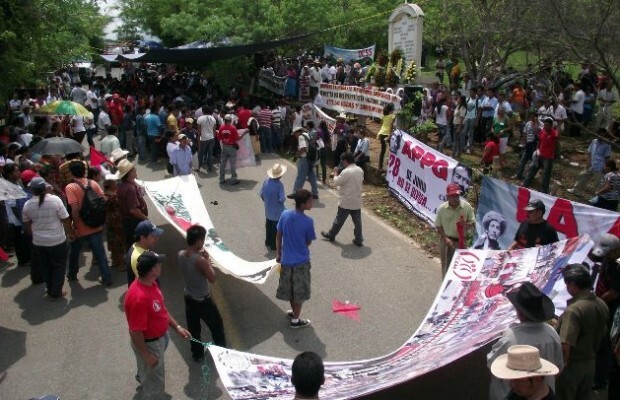 On 16 November in Atoyac de Álvarez in the Costa Grande of Guerrero, Juan Lucena and José Luis Sotelo were murdered, being campesino leaders of the El Paraíso community. The events took place a day before the annunciation of the creation of a communal police in the community and eight days after the murder of Luis Olivares Enríquez, director of the Popular Organization of Producers of the Costa Grande (OPPCG) in the Coyuca de Benítez municipality. One of the relatives of the victims noted that this was a political crime and that the murders could have been prevented by the police. At the scene of the crime there were two municipal police who, upon learning of the murder, did nothing. “This is a political crime that comes from power groups in the government who are out of control,” said someone to La Jornada. The motive of the crime is clear, because “as has occurred with other social activists, execution is the easiest way of getting rid of such people. They were leaders in the community, and they motivated everyone,” insisted the source. “Justice is its opposite, given that those who have committed crimes such as those accused over the Acteal case are free while those like me who are innocent continue to be imprisoned by the government,” noted Alberto Patishtán Gómez, a prisoner who had been incarcerated now for 12 years, in an interview with La Jornada. “It would seem that one has to kill in order to leave prison,” he reiterated, referring to the mode of resolution taken by the Supreme Court for Justice in the Nation (SCJN), which newly ordered the release of another prisoner who had been held for presumably having participate din the 1997 Acteal massacre. It should be recalled that now a total of 58 of the accused for this massacre have been released. Noé Castañón, secretary of governance, has announced that in this way that it has been done with all, there will be a convention made to provide them with lands so that they do not return to Chenalhó, so as to avoid problems in the area. Alberto Patishtán recalled that, differently, the SCJN decided not to review his own case, instead noting that the Primary Tribunal in Tuxtla Gutiérrez will be the one to decide whether or not the motion requested by his lawyers be reviewed. For its part, the Fray Bartolomé de Las Casas Center for Human Rights affirmed that the primary hall of the SCJN’s action represents a negation of justice to the thousands of people who processes have been replete with irregularities. Leonel Rivero, laywer for Patishtán, notes that regardless there is the possibility that the tribunal give him his reason and so immediately provide him his liberty. On 5 July Alberto Patishtán Gómez, adherent to the Other Campaign who, imprisoned for 10 years, found himself until last week detained in the Vida Mejor Hospital in Tuxtla Gutierrez, released a public letter in which he denounced that “[t]elling the truth and defending the rights of future generations and of society in general is still considered to be a crime in Mexico.” In this letter, Patishtán Gómez indicated that his experience has been that “institutional authorities” sentence Mexicans “for many years” and force them “to move from one location to another arbitrarily.” He refers to his own experience in “captivity” in the hospital in which he has been held “for nearly six months, isolated from all.” He adds that his health has deteriorated during his stay in the hospital, and he closes by requesting that he be returned to Prison No. 5 in San Cristóbal de Las Casas, in addition to being granted his liberty immediately.